The 2×5 series tucks numerous into the same sleek exterior of the 200 series, including a new and improved user interface for what we already considered the car GPS world’s simplest and most intuitive interface. Fortunately, the changes are truly enhancements, including the display of the posted speed limit for the road you’re traveling on (where available). While the 200 series did not provide traffic capability, even as an upgrade, the 2×5 series does, providing compatibility for both FM-TMC traffic and MSN Direct services, giving you a choice of services for real-time traffic monitoring. The 265T, 265WT and 275T include FM traffic receivers and a lifetime traffic subscription. The 285WT includes an MSN Direct receiver and a 3-month subscription. MSN Direct provides traffic and weather updates, fuel prices, movie listings, local events info, and more. If saving money on gas is important to you, the MSN service provides both the ability to avoid traffic and find the least expensive fuel. The nuvi 2×5 series includes Garmin’s “Where Am I?” safety feature which helps you find the closest hospitals, police stations, fuel stations, nearest address and intersection. It also lets you see your exact latitude and longitude coordinates. 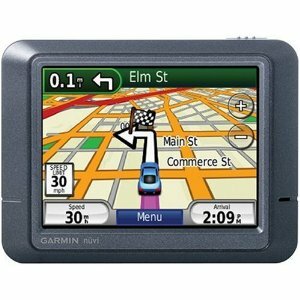 The 2×5 series includes the ability to send addresses to your GPS directly from Google Maps or Mapquest. Simply find a restaurant or other location you want to visit on Google Maps or Mapquest and specify “send to GPS” and the location will automatically transfer to your GPS when connected to your computer. The 265T, 265W, 275T and 285WT include text-to-speech capability which reads street names aloud, keeping your eyes on the road, not on the GPS. Garmin calls it “HotFix™”. Geeks call it “Satellite Ephemeris Data Prediction.” Whatever you decide to call it, you’ll find it to be another key enhancement found in the 2×5 series. With HotFix, your GPS remembers (for up to 3 days) the orbital position of all satellites it is tracking when you turn it off, predicting where they should be when you next power it up, dramatically reducing the time it takes your GPS to fix your position and start navigating. they should be the next time you turn it on. This gives the device an idea of where it should look for satellites, and dramatically decreases the time it takes for your Garmin to get its position and start navigating. No more long waits at the curb until the GPS is ready. Like the 200 series, the 2×5 series is sleeker, thinner and sports a more modern look, aided by the lack of a fold-out antenna, now an internal patch antenna. Still distinguishing the 200 and 2×5 series from mid- and high-end nuvis is the fact that none of the models include the ability to play MP3 files. However the 265T, 265W, 275T and 285WT Bluetooth capability for hands-free telephone operation.